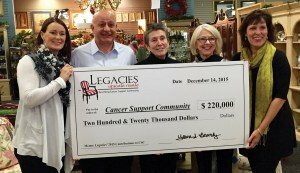 Legacies Upscale Resale has been “Finding Treasure, Funding Hope” on behalf of the Cancer Support Community for more than 21 years. At a volunteer appreciation event in December, leaders announced Legacies would contribute $220,000 toward the CSC mission in 2015, the largest contribution since Legacies opened in 1994. Over the years, Legacies has contributed close to $3 million to CSC, a local nonprofit offering social and emotional support and services free to anyone impacted by cancer through support groups, workshops and presentations, healthy lifestyle programs and social activities. General manager Laura Beverly, office staff and more than 40 volunteers were on hand, as were CSC executive director Michelle Johnson and staff. Johnson noted that in 2015, participation in CSC programs increased 7 percent, and off-site locations were added. 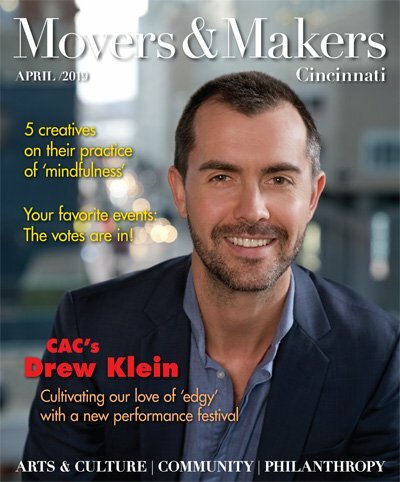 Legacies got its start when a dozen women created a store selling donated and consigned home furnishings to benefit The Wellness Community, now known as Cancer Support Community Greater Cincinnati-Northern Kentucky. Legacies, located in Hyde Park Plaza, quickly gained a reputation as a source of reasonably priced, high-end merchandise benefiting a worthy cause.